A young woman, just a few weeks past her 18th birthday, awaits the birth of a longed-for honeymoon-conceived baby. She was my mama, and that baby was me. My sweet mama lived to see my 3rd birthday before her time on this earth was cut short by a reckless driver. I don't remember her apart from two fleeting mind pictures. There's no-one to tell me about her. I can only imagine. But I'm sure she had marvelous hopes and dreams for my life while she waited out her final months that long hot summer of ’59, rounding her teenage hands over a tummy stretched tight and imagining good things to come. As a young mother of 18 myself, I was in awe of a newborn son cradled in my arms one early March morning. The emotions were indescribable and as he snuggled close, I imagined my own hopes and dreams for his life. Some came to pass and others were nothing like I imagined, because life is never really as we would have written the story is it? Yesterday I sat with my Bible open at Psalm 139 and let the words sink deeply into my thoughts. I was struck by the vast difference between an earthly parent and a Heavenly Father; the limited dreams of my human desires, and the eternal knowing of an omnipotent God. Whilst my mother dreamed of what my life would be like, and I imagined the path my son would follow through the years, God KNEW before any of us were conceived exactly who we were, what we would be become, and how the story of our life would be written. So I woke on Friday morning to another birthday, and for the very first time I imagined my mother cradling me in her strong young arms and the love that coursed through her excited heart. The vision was overwhelming and I spent most of the morning wiping away salty tears as they would intermittently escape without my permission. But they were good tears because the more they fell the deeper I felt God's love for me. I knew that HE KNEW. Every loss, every pain, every sorrow, every disappointment, every betrayal...HE KNEW before I was born. Every joy, triumph, delight, commitment...HE KNEW. 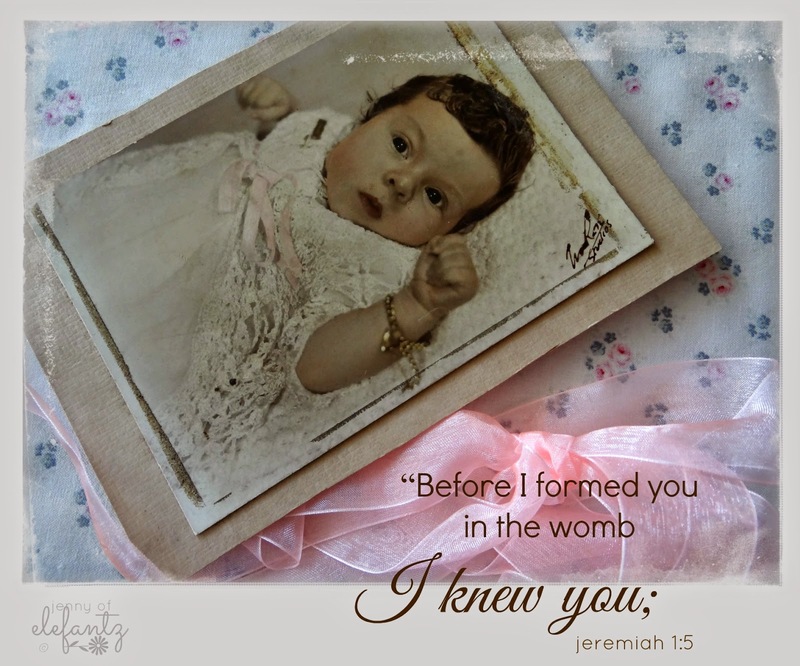 Because unlike earthly parents who imagine the lives our children will grow into, HE KNEW my life and your life before we were formed in the womb. And that is comfort beyond measure. Nothing is a surprise to Him and before I face any joy or sorrow HE IS THERE waiting to lift me high, or hold me tight. He is never not there. I'm the one who forgets Him. So I'm going to let this truth soak deeper into my spirit as I open the gate on another year in this temporary life, and be mindful that He KNEW and no matter what I face, He's already there. My friend, that same Father KNOWS you too. Happy Birthday Jenny! I rely on this verse a lot, and what comfort it gives. Have a wonderful birthday Jenny. That's so sad, she was so young but as you say it makes you appreciate everything and everyone. I lost my Mam when I was 25 & felt cheated. I've been very blessed in my life since & very grateful. Your post is a very uplifting one. 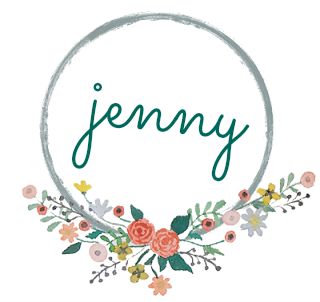 A heartfelt post, Jenny, and one that had me tearful. What a blessing as I tread through dark times, to know that He already knows. That He knows the causes, the pain, and even the outcome. Thank you for a sweet reminder. And happy, happy birthday to you! Happy birthday Jenny. That's one of my fav verses. You bring so much comfort, hope & inspiration to your readers. I'm so grateful I found your blog. God loves you and we do too! A beautiful post, sad but heartwarming. I'm sure your mum watches over you just as God does. Hope you had a lovely birthday. Happy Birthday Jenny. I was born one day before you (exactly) but seeing as I live in North America we actually celebrate our birthdays on the same day. These are wonderful thoughts to ponder on one's birthday and it is comforting to know that God knows even when I don't understand the course my life takes at times. I am so sorry that you lost your mother so early in your life. My husband lost his mother in his early teens, he knew her and remembers the loss & feels it deeply. Last week it was his birthday and he is now the same age as his mother was when she passed suddenly due to a brain annurism (no idea how to spell that). On his birthday he was holding a 10 day old daughter watching a 4 1/2 year old daughter play and I watched him as he thought. I can only imagine what was going on in his mind. I count myself deeply blessed that my mother is still here. This year she will be the same age her mother was when she died of breast cancer. Grandma seemed old then to me (I was only 7) and as I look at my mother I can't see her as being old. Nor can I imagine how my father in law processed the loss of his wife so young. I find the place of God in loss and tragedy so hard to get my head around sometimes but I trust that he is there in all things and that he always has been and always will be. I hope you have a lovely birthday and that you find comfort in the knowledge that your heavenly father was, is and always will be with you in everything, every time and every place. I can imagine her delight in looking at her beautiful little girl - gosh you were adorable, Jenny, and still are! Happy Birthday! I was crying too by as I read your post. It's so overwhelming when we think of how God has everything aligned perfectly, even when we don't always see it. Thank you for reminding us of that. Happy, happy birthday to you. What a gorgeous baby! Love that scripture. Happy Birthday Jenny. I always say birthdays are a celebration of our mother's who gave birth to us, isn't it good to add God to that, as He knew us before anyone. My mother used to always call me at the time I was born (thank goodness it was 9am) on the date I was born and say "Happy Bithday to us!!" What she meant by that was God, her and me...she always said others could wish us a happy day, but the day of my birth was truly an intimate and loving moment that could be shared between the three of us. I never did hear my dad's opinion on that, but he always let my mom be a little selfish where her only little girl was concerned. so heartwrenching! what a beautiful baby and so lovingly dressed. It's evident that your mum loved you and was happy you were a girl. Thanks, Jenny. I could feel your heart touch mine. HE KNEW.....thank you for this post, Jenny. So beautifully said Jenny. The time you spent with the Father is precious and your words speak volumes. The fact you took the time to share them with us is a gift. Thank you.